No sooner had 2014 ended than I had started my 2015 running campaign in the shape of a traditional English cross country race – the Northants County Cross Country Championships. Traditional as in the usual concoction of wet, windy, and muddy. And no where to shower post race. I slipped and slid around the waterlogged muddy four lap 6 mile course, with much effort wasted going every way but forwards, and came 5th in 37:37. My decision to run rested on a variety of factors, one being the connection I felt with the venue, Croyland Park in Wellingborough. Wellingborough is a rather uninspiring market town in middle England but is my, my parents and my grandparents place of birth. The park is where we would occasionally hang out some Saturday afternoons, kicking ball or just larking about. And the park was where I last ran this very same competition back in 2003, watched from the sidelines by my grandfather who was then still alive. On that occasion, on a visit home while resident in Malaysia, I was runner-up, ten seconds shy of the winner. I wore my old cross country spikes, the ones that had gathered dust in the closet, last used in the same championship race at the same venue back in 2003. Unfortunately the 10 mil spikes, permanently resident in the shoes owing to their being rusted in, were not up to the task. These were some of the worst underfoot conditions I can remember running in. The short spikes left me warily descending inclines, half scrambling up steep inclines, taking corners wide, and vainly trying to navigate the driest route. 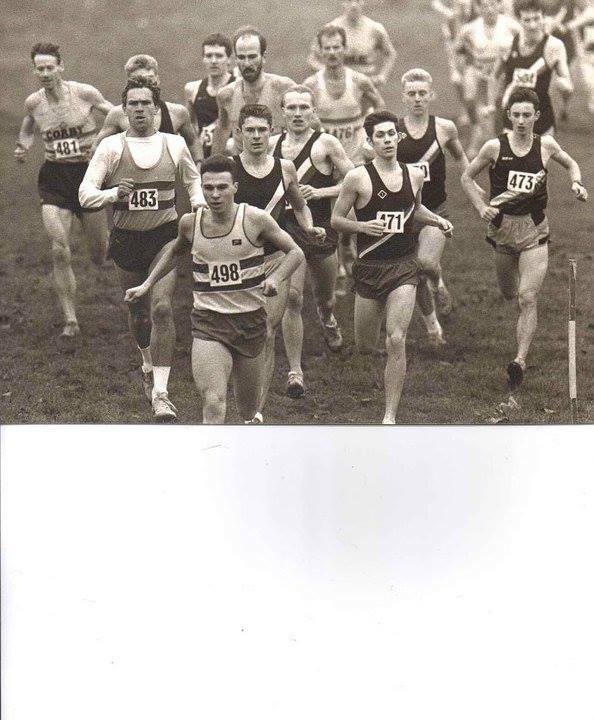 As in 2003 I competed for my UK club, Kettering Town Harriers. The men’s open team could only manage 3rd place – with me and my brother Steve being 1st and 2nd scorers. A respectable result but well out of contention for first place. However, there was success for the younger age groups. As an old running rival Terry Egan pointed out that fifth place was a repeat of my placing in 1989 at the more tender age of 23! And was enough to earn me a spot in the Northants’ team for the UK Inter Counties Cross Country Championships on March 7, a race which is also a selection race for the British team for the World Cross Country Championships. If I happen to be in the UK around that time then I will run. My best placing in this national championship race is 32nd, some 23 years ago This time 132nd might be a more realistic goal. It’s got me thinking about my running game plan for 2015. I turned 47 this past week and to ‘celebrate’ I ran 88 miles, my highest ever. I’d have eked out the ‘extra’ 2 to make it 90 had I correctly totted up the miles just before I headed out on a damp evening in Kettering, UK, my home town, for a 4 mile easy run. My highest mileage week started with a 20 mile run with some 25 Kettering Town Harriers in garish Santa festive wear with a glass of mulled wine and chocolates at mile 16. Not the highest quality workout but a long run nonetheless. The week also included 15 miles, with my brother Stephen and Kettering Town Harriers training partner Ron Searle, and some shorter runs in the dark early mornings around Stratford-upon-Avon while on a city break with family. The week crowned my year, one in which I spent the eve of many races anticipating the runner’s cliff, when age suddenly takes its toll and the times start to plummet. And yet I never ran over the cliff. I started the year’s racing in early March running 16:02 in the Coogan’s Salsa, Blues, and Shamrocks 5K and ended it in October with 1:11:15 at Grete’s Great Gallop, 13.1M. That latter race was a big morale booster and a turning point for the year. Mid-summer I decided I was not fit enough to have an autumn/fall assault on my marathon PR of 2:29:56 (from London 2006 when I’d just turned 40). So I spent several months unsure where my running was headed and turning in some good, if unspectacular, results. Realizing I was stuck in a runner’s rut I decided to shake things up by throwing in a few high intensity weeks in early September, including a week-end in Boulder, CO.. It worked. 1:11:15 was 6 seconds faster than the same race in 2011 and barely a minute off my fastest time for in that race some 4 years previous. It also meant I finished the year unbeaten in all bar one race by an over 40 runner and first overall age grade in all except a few races. These races got me some top 3 rankings in the UK for M45-49. So what will 2013 have in store? Well as I write, my entry for the semi-elite, UK Marathon Championships entry in April’s London Marathon has been accepted. All I have to do is fork out around 40 pounds, a bargain compared with its sister race, the New York City Marathon. And this is partly why I ran the 88 miles last week – to make a start on preparations as well as prove to myself that age is no barrier to running further, if not faster. If I do decide to run London that will keep me occupied in the early part of the year. As part of the build-up I may do the USATF Masters Half Marathon Champs in Melbourne, Florida in early February and aim for something close to 1:10 and a top 3 placing. If London goes according to plan, and I get a PB/PR, I might be tempted with the Chicago Marathon in October. The Philadelphia Rock and Roll Half Marathon in September would make a great build-up race – or a great race in its own right. The start of the Rock and Roll Philadelphia Half-Marathon. In between these ‘big’ races I aim to run as many New York Road Runner team scored races as possible. In 2012 my Warren Street masters team was 2nd: a night at the Hard Rock Cafe in March awaits to collect the team award – and hopefully the individual for M45-49. Winning back the masters’ team top spot is a goal for 2013. NYRR Club Night 2012 at Hard Rock Cafe. Postscript: The week after I wrote this I ran 91 miles.